LONDON -- The Royal Saudi Air Force has used British-supplied cruise missiles against Houthi rebels in Yemen, Defense Secretary Michael Fallon has confirmed. The Storm Shadow long-range cruise missile was among a list of British-supplied precision-guided weapons named by Fallon as having been used against the Yemeni rebels since the two-year-long conflict erupted following a Houthi coup which saw the legitimate government forced into exile in Saudi Arabia. The MBDA-built Storm Shadow has been in service for a number of years onboard Royal Saudi Air Force and British Royal Air Force Tornado strike jets. The weapon, the most powerful missile in the RAF inventory, has been deployed in several conflicts by the British but this is the first confirmed operational firing by the Saudis. The other British-supplied precision-guided weapons listed as having been used in Yemen were the Dual Mode Brimstone, ALARM anti-radiation missile, Paveway guided bombs and the PGM500 (also known as the Hakim 2), Fallon said in response to a written Parliamentary question. Doug Barrie, the senior air analyst at the International Institute for Strategic Studies, said the firing of the cruise missile was "a notable first for the Saudis, as is the fact they continue to use the ALARM anti-radiation missile taken out of service by the RAF in 2013." 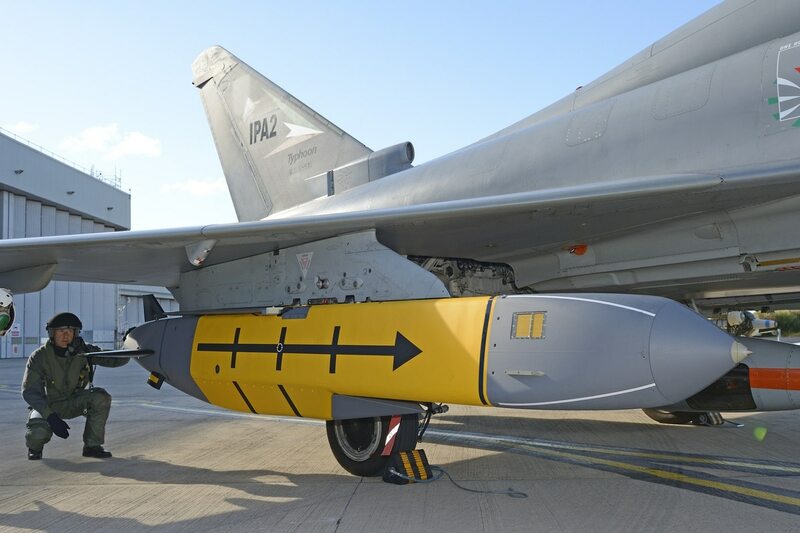 All the weapons mentioned were supplied by MBDA, with the exception of the Paveway IV, which is a Raytheon UK product. The MoD failed to respond in time to a question about whether non-precision weapons also have been used. Publication of the British air-launched precision-guided weapons used in the Yemen war comes at a time of growing international condemnation of the number of civilian deaths caused by the Saudi-led coalition's air strikes. Anti-arms campaigners and others have been trying to pressure the British government into a ban on arms exports to the Saudis, so far without success. A recent Saudi air strike killed at least 140 people, with hundreds more injured, when aircraft attacked a funeral party in the country's capital Sana'a. The Saudis later said they had been supplied with inaccurate information about the target. Fallon listed only precision-guided weapons and no mention was made of the controversial UK-supplied BL-755 cluster bomb. Earlier this year the British government denied the BL-755 , originally built by Hunting Engineering, had been used in the war after Amnesty International showed pictures of a partially exploded munition in a village in northern Yemen. The Saudis and their coalition partner, the United Arab Emirates, are both known to hold stocks of the internationally banned cluster weapon, said Amnesty. British defense officials said at the time that the weapon had not been exported since 1989.